Jaume Plensa, Julia’s Words, 2017. Wood, 78.63 in x 21.35 x 34.25 inches. Courtesy of the artist and Richard Gray Gallery. Photo: Gasull Fotografia. 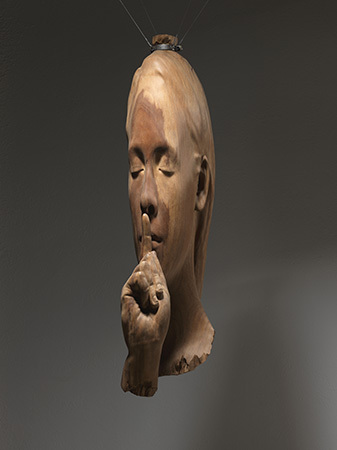 Richard Gray Gallery is pleased to announce two exhibitions of work by Spanish artist Jaume Plensa. Located at Gray Warehouse, Secret Garden presents recent sculptures in wood, stainless steel, and bronze, in conjunction with a suite of drawings. The exhibition continues at Richard Gray Gallery’s Hancock space with a portrait series carved in alabaster, as well as a selection of historical works in a second exhibition titled One Thought Fills Immensity. Featuring works from 1989 to 2002, One Thought Fills Immensity offers a deeper view into the artist’s prolific career. The two exhibitions open with a public reception for the artist at Gray Warehouse on Thursday, September 14 from 6 to 8pm. A Q&A with Jaume Plensa and curator Brooke Kamin Rapaport will take place at Gray Warehouse on Friday, September 15 at 10:30am. The two exhibitions will be included in a forthcoming monograph on Jaume Plensa published by Skira Rizzoli, to be released in winter 2017. Contributions by: Brooke Kamin Rapaport, Director and Martin Friedman Senior Curator of Mad. Sq. Art at the Madison Square Park Conservancy, New York; Clare Lilley, Program Director at the Yorkshire Sculpture Park, West Bretton, Wakefield; Catherine Millet, Paris-based writer, critic, and founder of art press magazine; Fumio Nanjo, Director of the Mori Art Museum, Tokyo; and Jeremy Strick, Director of the Nasher Sculpture Center, Dallas. The pursuit of self-knowledge is a central concept in Plensa’s studio practice. One Thought Fills Immensity borrows its title from William Blake’s Proverbs of Hell, 1790. As an avid reader of literature, Plensa finds inspiration in the work of poets like José Ángel Valente, William Blake, and Elias Canetti. On Blake, the artist states “‘One thought fills immensity’ [is] a marvelous concept in which our ideas are expanding out [and] filling up the space, not with physical objects, but with energy.” The pursuit of a heightened awareness and inquiry is articulated across Plensa’s oeuvre. One Thought Fills Immensity features important early works such as Firenze II (1992), the first work in which Plensa took the concept of the question as a point of departure. Plensa’s work has been the subject of solo exhibitions at museums worldwide, including: Museo Nacional Centro de Arte Reina Sofía, Madrid (2000); The Frederik Meijer Gardens & Sculpture Park, Grand Rapids (2008); Musée Picasso, Antibes (2010); Nasher Sculpture Center, Dallas (2010); Yorkshire Sculpture Park, West Bretton (2011); Espoo Museum of Modern Art, Helsinki (2012); Cheekwood Botanical Garden & Museum of Art, Nashville (2015); Max Ernst Museum Brühl, Germany (2016); and the Musée d’art moderne et contemporain, Saint-Étienne Métropole (2017). Select public installations include: Crown Fountain (Chicago, 2004); Echo (Seattle, 2014); Wonderland (Calgary, 2013); Breathing (London, 2008); Roots (Tokyo, 2014); and Source (Montreal, 2017). Forthcoming projects Pacific Soul (San Diego) and Dreaming (Toronto) will be installed in the fall of 2017. Plensa lives and works in Barcelona. These two exhibitions mark Jaume Plensa’s ninth and tenth solo exhibitions with Richard Gray Gallery. Plensa has been represented by Richard Gray Gallery since 1996.